Unlike cart-tracks and horse-trails, railroad rights-of-way must be as close to level as the terrain allows, and the curves must be wide, to enable the locomotive to pull most effectively. In mountainous regions, this means that hillsides are often cut away, leaving steep "walls" of stone and earth that can pose danger to the railroad, especially during freeze-thaw cycles. 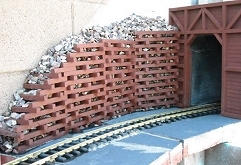 Engineers (not the kind that drive trains) use "cribbing" to stabilize such walls without resorting to a full-fledge retaining wall, which has its own maintenance issues. 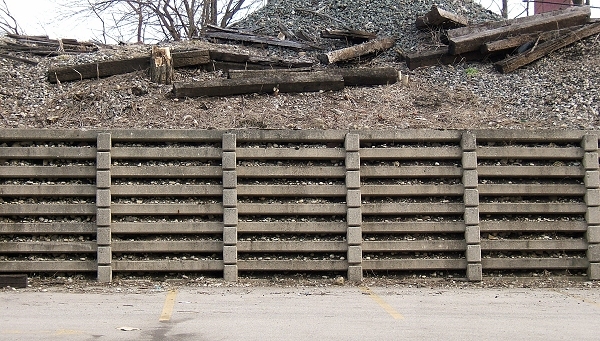 From the "outside," a cribbed wall usually looks like someone has arranged timbers in a "basket-weave" pattern. What you can't see is that for every two or three timbers that run lengthwise along the wall, there is one timber that goes deep into the wall to help "anchor" the other members in place. 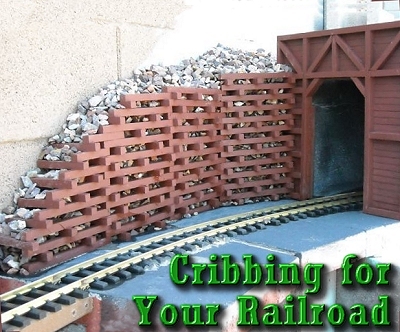 When Daryll Smith added a cribbing feature to his railroad and sent me some notes about it, I figured this was as good a time to present this content as any. Cribbing in the "Real World"
In the 1800s, cribbing generally used the same sort of timbers the railroad was using for trestles. 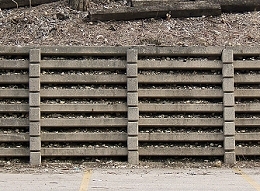 For small applications, railroad ties might be used. You can still occasionally see timber cribbing, especially in very dry climates. 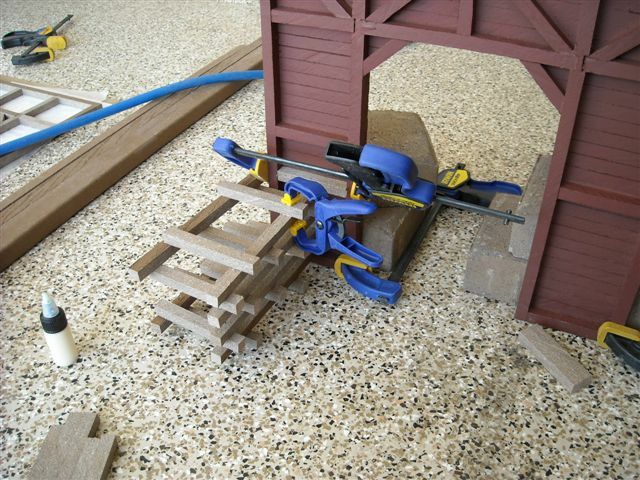 But today, cribbing may be made of other materials. The cribbing at the left below is made of reinforced concrete beams. It is near the Webster Street market, in Dayton, Ohio, in case you wanted. 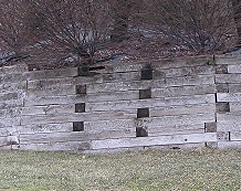 The cribbing at the right below is made of timbers that have been treated the same way railroad ties are treated, but these have never borne a rail. It is on the campus of Wayne State University, in Pennsylvania. 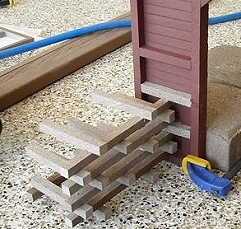 The Wayne State cribbing is unusual in that it doesn't have huge gaps between the cribbing material to allow for rushing water to pass through safely without taking the wall down with it (a potential problem with retaining walls). Of course all this cribbing is holding up is a tennis court or something like that, I think. But you can tell that there are timbers aimed inward. These inward-pointing timbers, called "deadman" pieces, are "anchored" in by the weight of earth and rocks upon them, like oversized stakes. When the builders fasten the more visible "sideways" timbers to the "deadman" pieces, the pressure from the earth or stone wall's surface doesn't keep inching the cribbing outward. 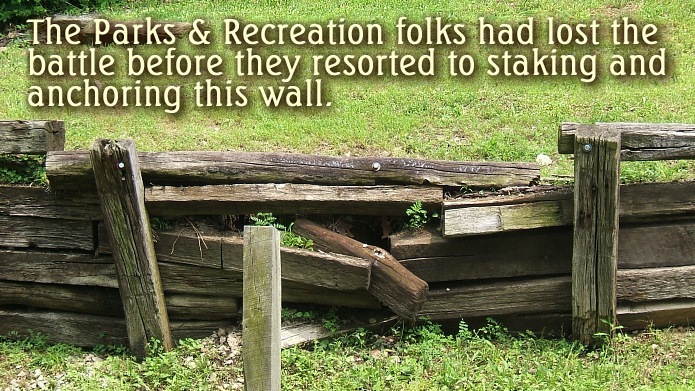 In the "real world," you've seen dozens of cases in which amateur landscapers attempted to hold earth in place by stacking railroad ties (or cheapo landscaping timbers) across the face of the "wall" to be held back, without ever considering the "deadman" solution. 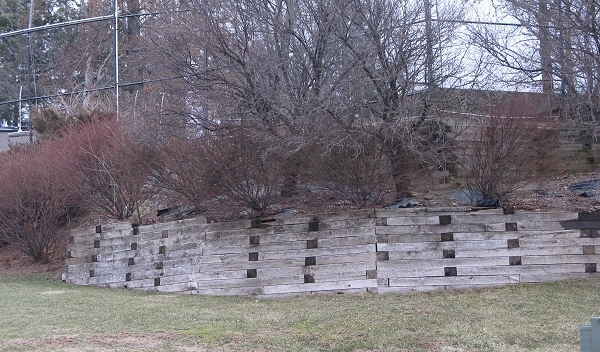 Inevitably, these home-made "retaining walls" succumb to outward pressure and collapse, sometimes with ugly results. That said, "cribbing" on most garden railroads is virtually cosmetic, holding back pounds of dirt instead of tons. 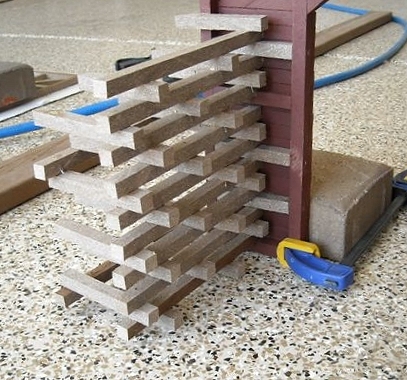 Often you see a "latticework" or "basketweave" arrangement of tiny "beams" with no evidence that anything is really poking into the wall that the "cribbing" is ostensibly holding up. No problem, really. 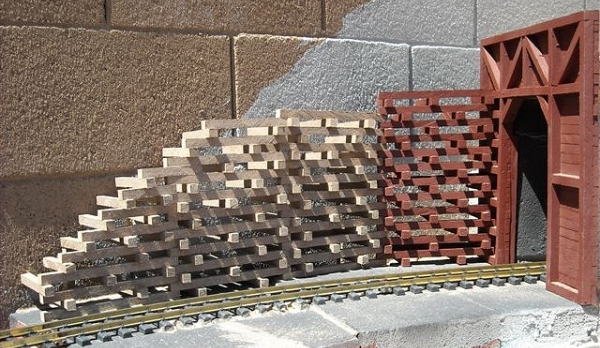 But I get especially interested when I see model railroad cribbing that looks to be constructed just like the real stuff. When Daryll sent me a bunch of photos that included his HDPE timber "cribbing," I knew this would be a pretty neat feature to include. 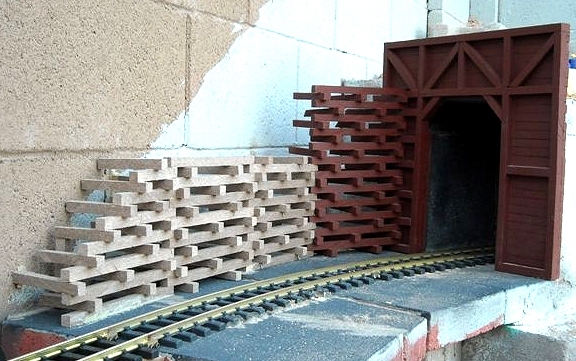 The rest of this article really focuses on the cribbing that Daryll built to accompany the tunnel portal project he documented for us earlier. Daryll made the cribbing from "plastic" deck lumber cut into 1/2" x 1/2" pieces. The plastic deck lumber shows the saw blade swirls from ripping. This helps the beams look like rough-cut lumber from a saw mill, which the paint highlights. 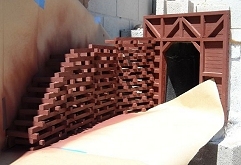 As you'll see eventually, Daryll needed 32" of cribbing so he constructed the walls in 8" sections. 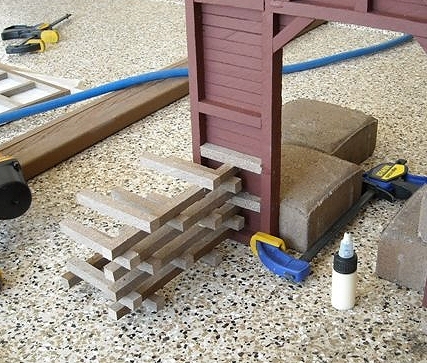 In this photo, you can see that Daryll started his cribbing project by attaching a few bits of cribbing to the tunnel portal at the floor level and working upward. In this photo, the higher "lengthwise" timber in the back is just there to hold things in place while the cribbing is being nailed together and until the glue dries. Eventually, he'll attach it a little higher. Daryll used Titebond glue and #18 wire nail in his air gun. 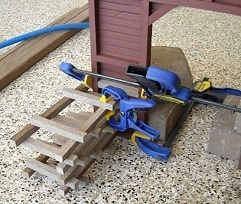 In this photo, you can see that he has removed the temporary "support" timber. Daryll has expanded his cribbing vertically. You can see that another "permanent" support timber has been added at the back. 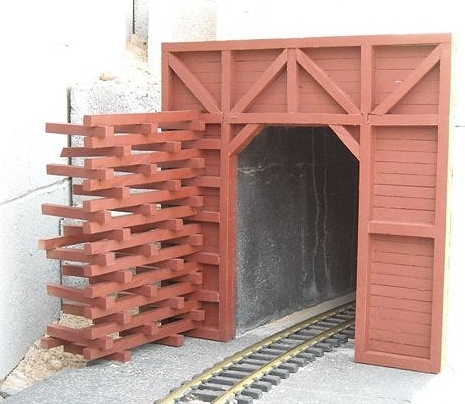 In this photo, Daryll has used Krylon Red Primer to paint the cribbing the same color as his portal and has set this assembly in place on his railroad. Daryll has built two more courses of cribbing and glued it in place. If you click on the photo to see the blowup, you can see that the horizontal timbers in the adjacent courses overlap like Lincoln logs, contributing to the overall strength of the structure. Daryll has built up the cribbing so that it slopes upward, ostensibly to match the line of the "mountain" he is holding back. Daryll has taped "butcher paper" around the cribbing so he could spray paint it. Why paint it in place and not in the shop? One reason is that glue does better when it's gluing unpainted surfaces. Daryll has "backfilled" the cribbing with crushed gravel. If he didn't live in a very dry area, I might suggest backfilling with a mix of dirt and rocks and sticking acre sedum starts on the top and here and there in the cribbing itself. Still, this will make a fantastic "transition" to the mountain he is going to be adding as he moves forward. 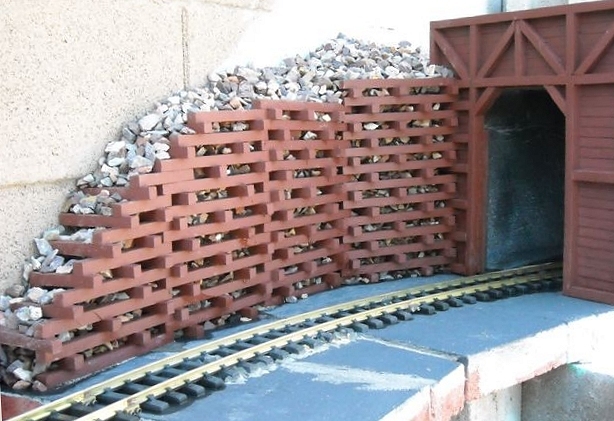 Daryll has not only made a cosmetically impressive addition to his railroad; he has engineered it like the real thing. 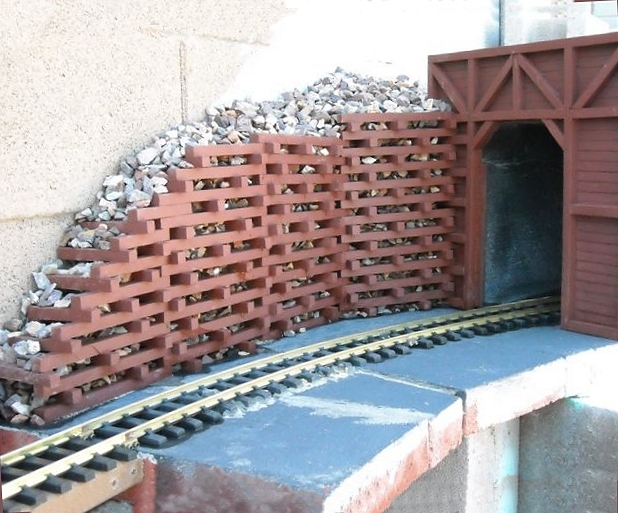 In the meantime, Daryll is moving so fast on his railroad, he will probably have more great photos to send by the time this page is posted, but I wanted you all to have a chance to see this in time to plan your mid-summer projects. If you have any comments or questions about any of Darryl's projects, please contact me and he will forward me your comments.